XtraCal™ Plus is specifically formulated for the dietary management of insufficient protein and calorie intake. It is a low volume high calorie concentrate made from MCT oil and two sources of protein. Provides 230 calories and 14 grams of protein per packet. Add to most beverages and soft or pureed foods to create nutrient dense alternatives to nutritional supplements. The key is faster absorption of calories and protein for better utilization and tolerance. Water soluble. Mixes easily into liquids and tube feed formulas. DIRECTIONS FOR ORAL USE: Add to milk, shakes, juice, soft and pureed foods or puddings. 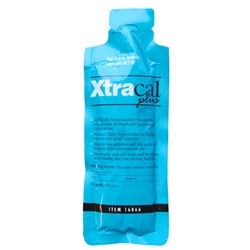 TUBE FEEDING: Add one packet of XtraCal Plus to 120 mL of water. Stir briskly for fifteen seconds and let stand for a minute to allow for complete dispersion. Flush feeding tube with 30 mL of water. Infuse XtraCal Plus and water via syringe down feeding tube. Flush with 30 mL of water. INGREDIENTS: Medium Chain Triglycerides, Protein (from Collagen Hydrolysate, L-Leucine, L-Tyrosine, L-Methionine, Whey Isolate, L-Histidine, L-Isoleucine, L-Tryptophan, L-Lysine and L-Threonine), Purified Water, Sucrose, Sodium Acid Sulfate, Phosphoric Acid, Natural Flavors, Tartaric Acid, Potassium Sorbate and Sodium Benzoate (to preserve freshness). Contains a milk derived ingredient. Home | About Us | Customer Service | Terms | Join Our Mailing List © 2019 Med-Diet, Inc. All Rights Reserved.